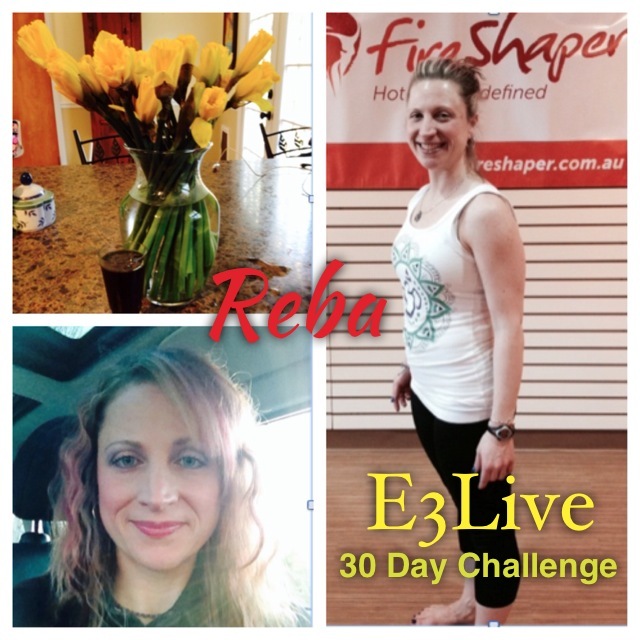 E3Live 30 Day Challenge – Reba is Finished! Watch her end of challenge video: E3Live 30 Day Challenge – Reba is Finished! On top of the world. On a trail, hiking and some small jogs. Feeling so wonderful that I felt the need to strike a pose! The most amazing thing to me that I’m able to still handle my busy schedule, go on vacation, relax, adjust easily to different time zone, and not affected by altitude…..I really feel it’s E3Live products. NO DOUBT! You know that song by Imagine Dragons? “On top of the world”, that’s the song that keeps running through my head! No joke! I got up and took my E3RenewMe!, went for a hike, came back to a shot of BrainON. I highly recommend going on vacation and staying with your daily routine when it comes to eating and taking vitamins/supplements. Keep hydrated. It’s all key to enjoy your vacation at it’s maximum. Oh, and DON’T check the emails! Still on vacation in Colorado and still sticking to my plan. Again, as I mentioned before, it’s not a plan or a challenge for me anymore. It’s a way of life. I’m up to taking E3Live RenewMe! in the morning and afternoon with about 8-16oz of water. In between, I take two shots of E3Live BrainON, one in the morning and one in the late afternoon around 3pm (ish) which is precisely when I get that tired/bored feeling and want to indulge in stupid amounts chocolate with crap preservatives in it. Feeling wonderful! Feeling so relaxed on vacation! Super long bike right throughout Denver. Fun, fun, fun! I missed my afternoon shot of BrainON and had a beer. Hey, it was a microbrewery…..couldn’t resist. No affect on my body whatsoever! You know, I’m 25 days into this routine. Even though my daily routine of working and exercising has been modified, oh….and my sleep…my routine of taking E3Live RenewMe! and BrainON is just a way of life. A good life. I’m still so completely amazed at my skin, hair, and nails. So healthy. When I look at pictures of myself and looking at my skin, I feel so very happy. I really feel that E3Live products are my “fountain of youth”. I’ve been told a few times over the past two weeks how amazing I look. I may have not lost my 5-8lbs I was looking for and I did lose 2lbs! Being almost 44 I have so much gratitude as the universe has really healthy dose of a beautiful life so far. A picture of my skin! Packing and going home to NJ. Blah! Because I get a little nervous to fly on a plane, my meals were on the lighter side. Still, I stuck to my routine of taking my E3Live RenewMe! and BrainON. The other thing that was on the top of my mind is the fact that Denver is 2 hours behind New Jersey. AND, I had to get up and teach a 6:15am Barre class at Fire Shaper. What is my body going to feel? I got home soooooo late. My plane was rerouted due to the storms in the mid-west. So, I finally got my head into bed by 2am. Alarm goes off at 5am. Up, up, and away! Feeling excited to teach my class! Yay! I really didn’t feel that much effects although later in the day I did require a 1hr cat nap. All good to go. Back to my routine and my body is resilient! The body is SO resilient if you treat it well. People, take care of the gift you were given. That is your body and your life. Treat it with love and kindness and it will give you just that back! Challenge? What challenge? A way of life. A new order has gone in to replenish my E3Live RenewMe! and BrainON. Why? Because I love my body feeling wonderful. As I said, I’ve completely removed “challenge” and replaced it with a way of life. It’s worth it to stick to the plan as the plan just becomes your regular every day thing. Do you want to feel wonderful every day? Even if life gets tough, or you have slips in your diet or maybe a glass or two or three (oops!) of wine….the important thing is to get back to the daily routine. Treat your body well. Eat well, drink water, and use E3Live products. There are no regrets! Tuesday, April 8: Another busy Tuesday for me. However, I’m feeling very energized. Got up, too my E3Renew Me!, taught class, went to work and took my shot of BrainON. Around 2:30, I got REALLY REALLY tired. I wanted to run out and go buy some of the luscious Easter candy that has been around EVERYWHERE. I wish something healthy like spinach or kale would be round in our faces rather than this sugary candy. Oh, well. I decided when I get this urge at 2:30 I would mix my BrainON with some carrot juice. It WORKED. I was able to gain clarity and my urge for white chocolate kinda just went away! Wednesday, April 9 – Woke up, took E3RenewMe!, drank water, ran hills….3 miles. Feel FABULOUS. Off to work! No urges today. Excited to hit a 7:30pm Lava class at Fire Shaper Hot Yoga. Yup! I stayed there until 9:30pm and practiced my handstands! YEAH! Thursday, April 10 – Ooops, missed my alarm. Maybe partying at the yoga studio and doing handstands had something to do with it? Meh….being hard on myself. E3RenewMe! And I did two shots of E3Live BrainOn. My shots, I’ve increased. I need a lot of focus during my day. All I do is sit sit sit. It brings me down a bit. Taught my yoga class tonight with my ladies at American Woman Fitness Center. I had 12 ladies. Loving the love! Friday, April 11 – Alarm, up, E3Live RenewME! Weeeeeee! Hot Yoga at Fire Shaper at 6:30am. Yup, on fire and feeling fabulous! My shots of E3Live BrainON, I’m taking about 2-3oz. I feel so focused and wonderful! The other thing I noticed is my hair, skin, and nails. VERY healthy! Not bad for 43!?!? I’ve always taken good care of my skin and I feel like by taking E3Live products it gives me such a healthy glow! Saturday, April 12 – Ouch…..the wine last night gave me a headache. It didn’t stop me from staying on my routine though. I am determined to keep on track. Many times I think when we’re not feeling so great, we fall off the wagon. So, I still took my E3Live RenewME! and made sure I took my 2 shots of BrainON today. However, I ate a half a back of these chips. I couldn’t stop. I was bored. I had such a GREAT day at the gym. I taught my willPower&grace class. Feeling good except for the mini-headache. Then, the later part of the day, I couldn’t stop eating these chips. I had nothing to do so I dove into the bag like no one’s business! Ugh! Sunday, April 13 – Ok, so I woke up feeling so great that I took a hot yoga class before teaching my Barre Shaper class at Fire Shaper. I woke up around 6am, took my E3Live RenewMe! I proceeded to do some house work (cleaned the bathroom….UGH!) and I ate wonderful raw breakfast…..oats, ground flax & chia seeds, organic wild blueberries, organic coconut, raw honey, dash of cinnamon, and some almond/coconut (unsweetened) milk. Then, I had a 3oz shot of my BrainOn. Breakfast feast it was! Monday, April 14 – So, when I got up, I realized that I finished that bag of chips I started on Saturday. Check out my video. I’ll explain. In two days, I ate a bag of chips. The serving for this bag is 12, not a great thing on my part. Not stopping me though. I still woke up, drank water and had my E3Live RenewMe!, and went for my 3 mile run. The day itself was awesome. I am about up to 4oz of E3Live BrainON. I took the shot with my carrot juice. I feel really good. Oh! I lost 1.5lbs. That’s a step. I thought I would have been horribly bloated from the chips. Summary of my second week: Although I did have some slips with my eating, I didn’t let it get me down. I am determined to still enjoy myself with a glass of wine, maybe trim the amount of chips, and stay on a good routine. Now, the weekends are tough so I am going to try to get a better handle on my eating habits on the weekends. Happy as heck! Peace out…..Namaste! Reba is finished with her first week of the E3Live 30 Day Challenge. Check out her journal from the first week! April 1 – It’s Tuesday. My most busiest day of the week! I could barely get out of bed. I was sooooo tired. However, I rolled out at 5:00am, hydrated myself with water and took my E3Renew Me! From there, I got ready to teach my 6:15am Barre Shaper class at Fire Shaper in Wyckoff, NJ. I was still a little cloudy and was confusing my ‘rights and lefts’ with my students. The class was good and I really wished I had more clarity. I just felt REALLY foggy. After that I had to hurry home for an 8:00am conference call. Somehow I was able to clean myself up and shower and have my BrainON shot! Scurried off to the office for a 4 hour meeting. Bored out of my mind, I was relieved to get to my desk to have my shot of BrainON again. I mixed it with some Kale, Romaine Lettuce, and Lime juice. The end of the day was at 5:30pm and had to run to the gym and teach my willPower&grace class at American Woman in Oakland at 6:30pm. Needless to day, I am pooped! Wednesday – April 2 –- Hello! I woke up at 5:00am feeling pretty good. Took my E3RenewMe! I did a few yoga poses to stretch out. My hamstrings felt very tight. After I did some yoga, I got ready for work and brought my two shots of E3 Live BrainON with me. As soon as I got into the office, I took my shot….. I felt that 2:30pm emotional eating urge come on. I was bored out of my mind and I so wanted to hop into my car and go buy a bag of those white chocolate easter eggs. I knew I was bored. So, I got up and made myself a cup of Yogi tea and took my second shot of E3 Live BrainON along with my kale, romaine lettuce, lime juice mix. After a long day at the office, I was literally “juiced” up and ready to go take Hot Yoga at 7:30pm. I stayed after class with the tumblers and we practiced different poses until 10:00pm! Thursday, April 3 – Alarm, water, E3 Live RenewMe! Weeeeeeeee! Feeling fabulous! I know I have a long day ahead of me and I’m feeling pretty darn good. Sitting at a desk for 8-9 hours is grueling, however, I had three people to do some life and career coaching with and it was time to put my superpowers on! Down the hatch with some E3 Live BrainOn. I had some really good sessions with my clients. My day ended at the office and I was off to American Woman Fitness Center in Oakland, NJ. I taught a double…..6:30pm willPower&grace class and then a 7:30pm Yoga Flow Class. I think it was one of my BEST yoga classes I taught ever! Although I plan my Yoga classes ahead of time with some idea of what I am going to teach, this time, I had no plan. I let the universe come to me. GREAT CLASS! Friday, April 4 – THIS GIRL IS ON FIRE! Woke up, water, E3 Live RenewMe!, 1 Hour Hot Yoga at Fire Shaper in Wyckoff, NJ. To the office for 9 hours and with me are my shots of E3 Live BrainOn! Ugh, my day ended with eating two slices of pizza and a giant salad for two. Meaning me eating the consumption of salad for two people. I felt yucky and bloated. Saturday, April 5 – I woke up feeling fabulous which I was completely surprised given the food I ate the night before. Plenty of water was on deck for me. I drank a lot of water throughout the night as well. But, got up at 6:00am, water, E3 Live RenewMe!, 90 minute Hot Yoga at Fire Shaper in Wyckoff, NJ. Then, I taught my willPower&grace class at 11:00am at American Woman Fitness Center in Oakland, NJ. I had my two shots of E3 Live BrainOn. This time I added another dose of E3 Live RenewMe!, in the afternoon on an empty stomach. I was ready for Saturday night to go out to dinner with my friend. So, here is my healthy selfie! Sunday, April 6 – I had two glasses of wine with dinner last night. I feel GREAT today! Ha! Ha! I woke up at 6:00am to get my day on. I have a class to teach and took a 90min Power Hot Flow Yoga class. Life is good! Bought some spring flowers and enjoyed my shot of E3 Live BrainOn next to the flowers! Monday, April 7 – Ready for the work week! I got up and ran 3 miles! Oh yeah! I woke up at 5:00am, E3 Live RenewMe!, went for my run. Got ready to sit in the office for 9 hours. I brought my shots and I took my RenewMe! in the afternoon on an empty stomach. Summary of my first 7 days – Yes, I went off the healthy eating wagon one day and had some wine. However, my body was set up to be VERY resilient. I ate very good all week. My meals consisted of a balance – veggies, protein, and quinoa. I ate quinoa all week. My biggest observation is that my energy, clarity and my skin looks fabulous. Enjoying this challenge! I’m sticking to a routine and not getting down for a slip in my diet. Peace out! Namaste! E3Live 30 Day Challenge – Meet Reba! Meet Reba! She is 43 years old and works in the corporate world in addition to being a life coach and yoga/fitness instructor. Reba will be taking fresh-frozen E3Live + BrainON and E3RenewMe plus exercising for 30 days. Reba wants to get a better h andle on her emotional eating…..get a better routine with exercise, and make better choices in terms of my body, mind, and soul. 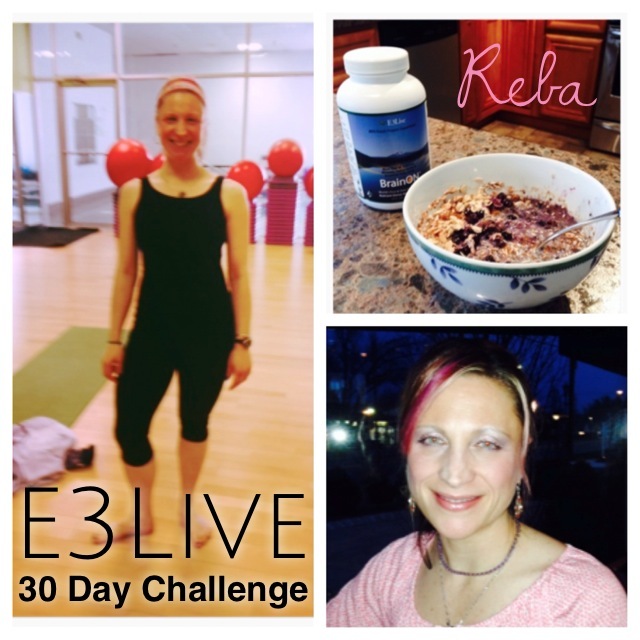 Here is the video at the start of her challenge: E3Live 30 Day Challenge – Meet Reba – Video!